When Australian born designer Lucy McRae’s work was exhibited this year at the Sao Paola Museum, the museum issued a statement which referred to her work as ‘provocative and often grotesquely beautiful’. A quick look at Lucy’s website brings an understanding of the ’grotesque’ part of the description. As for the beauty, that’s where it gets to be a bit of a stretch. Having said that, there is the Vogue ‘bodysuit’ project which saw Lucy collaborate with partner Bart Hess to create a body ‘garment’ used to illustrate a piece in Vogue on the use of fillers in plastic surgery. And then there is the safety-pin outfit created by McRae. Quite amazing really when you realise that McRae is wearing nothing more than safety pins stuck to her body to create the effect of a jacket which doesn’t look half bad. 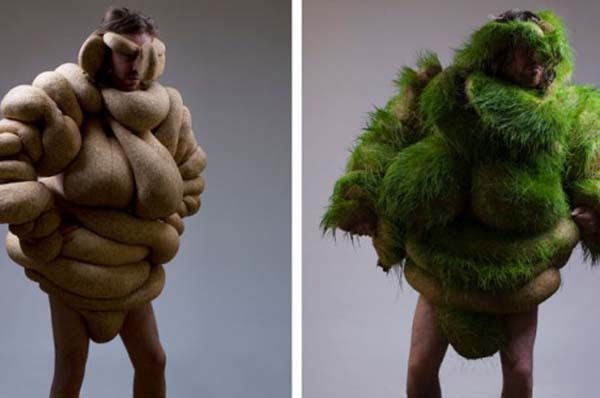 But then there is the ‘Grow On You’ outfit. Now that is strange. Even stranger is the way in which McRae says she originally got the idea. She says it occurred to her after she ‘instinctively’ dunked her head in a pile of soapy water while washing dishes. Right. As you would. And the result? Well I guess grotesque almost covers it. Draw your own conclusions. Take a look at the image below. However, there is a more serious side of Mc Crea’s work. Well slightly more serious. One of her high profile projects was created for the video for Swedish pop star Robyn’s Indestructible. The costume devised by Mc Crea was made of 1.2 kilometers of plastic tubing through which coloured water was pumped in time with the music. The result was a complex outfit to say the least. Mc Crea herself describes it as a “living, breathing, dynamic skin”. Hmm. Does this give a new meaning to the term ‘Skinflick’? Blogger Madeleine Rebbechi who describes Mc Rae’s work as ‘a second skin’ says that her creations are a fusion of ‘fashion, technology, design and the power of the human body to create pieces unlike anything we’ve seen before’. Well that would have to be right. I guess I can’t argue with a claim like that. My mother had a look at some of Mc Rae’s creations. ‘What are they’ she asked doubtfully. I explained as best I could, pointing out that Mc Rae had made it to the front page of Vogue – or at least to a full page of Vogue. My mother remained unconvinced. ‘Far out’ she said.